Today I will make a little confession... I'm not comfortable writing about fine dining experiences. Don't get me wrong, I enjoy treating myself to a fancy meal from time to time, but I feel like it's a big responsibility to recommend something that costs so much money. This is the reason why I never reviewed Thornton's (now closed) nor the Greenhouse when I had their dinner tasting menus last year, even though Mr. FFID and I had a great experience. After paying the bill I always think of my mam, who would give out to me for spending so much and feel a little bit guilty... just for a fraction of a second though, you only live once after all. 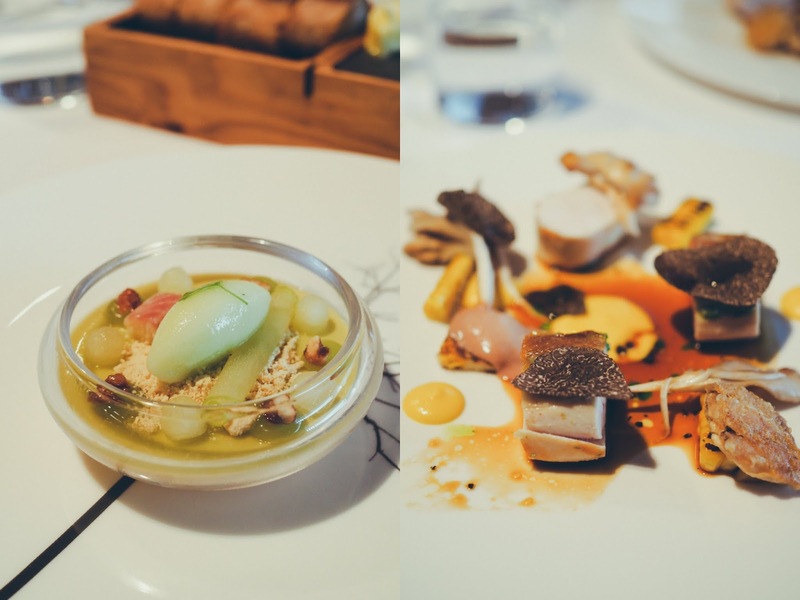 My general advice if you're not loaded and want to try Michelin-starred restaurants in Ireland is to go at lunchtime to get the best value for money; I totally recommend Restaurant Patrick Guilbaud and Chapter One for lunch. Anyhow, I recently returned to the Greenhouse to try their lunch menu and I wanted to tell you about it this time. 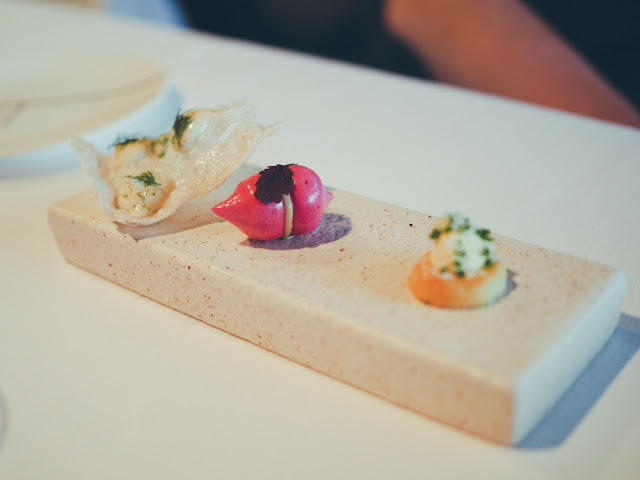 For many years people in the food industry were puzzled as to why that head chef at the Greenhouse Mickael Viljanen hadn't been awarded a Michelin star, until it finally happened in 2015. The Greenhouse's dining room is quite small but contemporary and elegant with blue velvet chairs and banquettes. I couldn't really take pictures from where I was sitting, so I'll leave you imagining it... The first time I visited I was in the main area while on this occasion I was at one of the four tables that are located at the back (which doesn't have as much natural light) and from which we could actually see a bit what was going on in the kitchen. 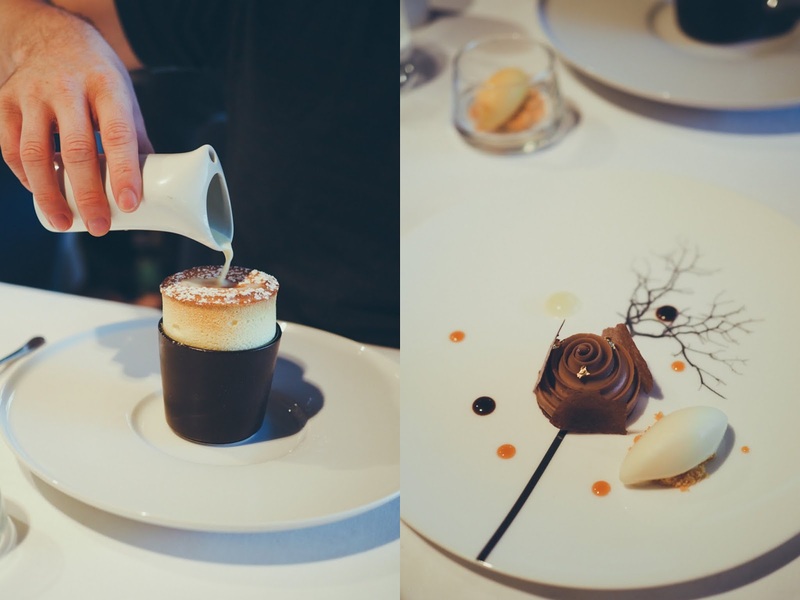 For dinner the Greenhouse features a 4 course menu at €79, a 6 course tasting menu at €95 or a 5 course surprise tasting menu at €85, depending on the day of the week. Lunch is a more affordable affair with options like a 2 course menu at €35 and 3 courses for €39.50 as well as a 5 course surprise tasting menu at €75. Having been for their surprise tasting menu on our previous visit we went for the 3 course menu this time. We were first brought some slices of excellent fresh sourdough bread with butter as well as three little snacks. The beetroot meringue with chicken liver pâté burst in the mouth revealing its delicious flavours, leaving you wanting more. The anchovy cracker and tiny parmesan sablé were delicate and tasty mouthfuls too. Mr FFID and I being one stomach at this stage ordered the same starters and mains. 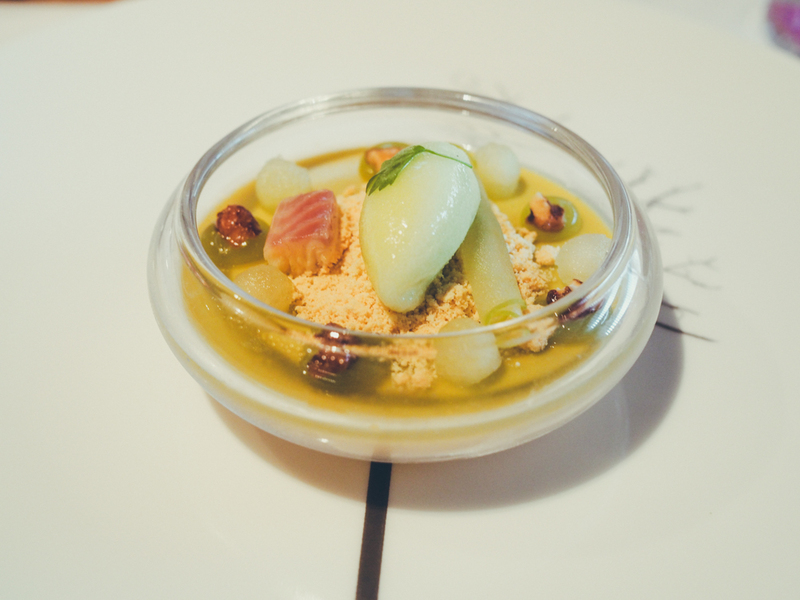 The foie gras royale is a stunner of a dish, a medley of temperature and textures between the foie gras, apple, the walnuts, the crumbs and the little piece of smoked eel. Somehow it's elegant and indulgent yet light and refreshing at the same time. Chicken dishes can sometimes be disappointing and bland in restaurants but not at the Greenhouse. 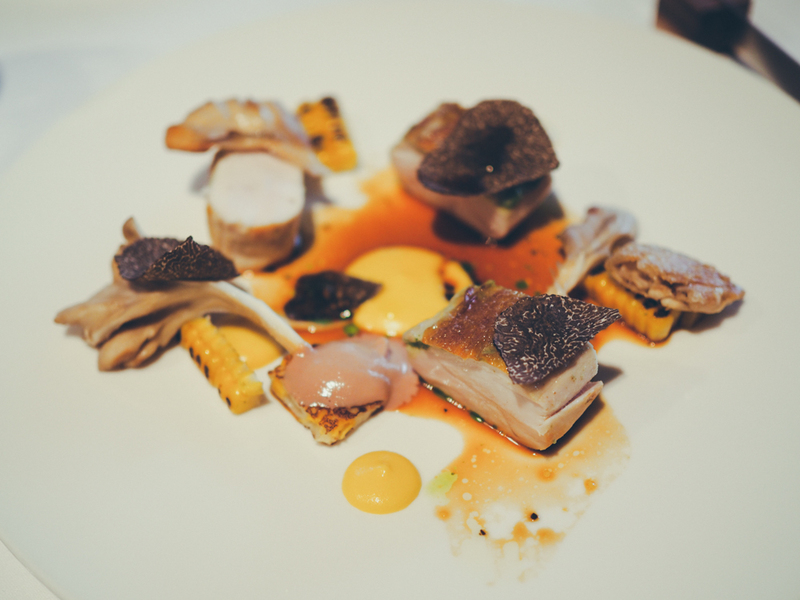 There were pieces of juicy chicken, sweet corn in different forms, mushrooms, creamed liver and a few generous shavings of Australian truffle. A great dish with earthy flavours. I rarely go for chocolate desserts but this time opted for the chocolate tart which came with a tangy yuzu sorbet, it was good and just the perfect size. I was a bit envious of Mr. FFID's passion fruit soufflé with a white chocolate and ginger sauce though, pure soufflé perfection! 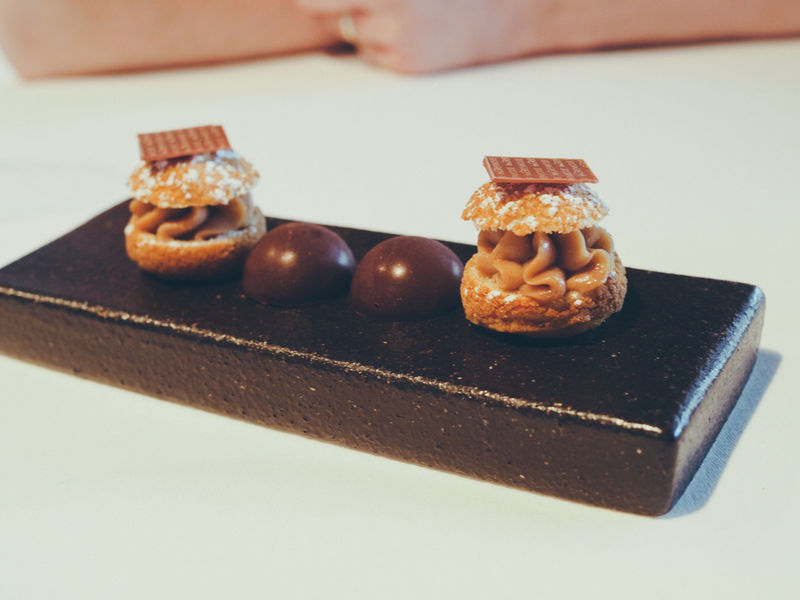 The petit-fours, a small choux bun filled with hazelnut cream and the whiskey and praline chocolate were a nice touch. Service at the Greenhouse is very professional and more formal than most places, but without being stuffy. It's far from cheap but you're paying for a level of cooking, ingredients and service that are far above the average. A three course lunch with a bottle of wine ended up costing around what we would usually spend for dinner in a casual restaurant. The Greenhouse is one to think of for a special occasion or simply for treating yourselves, you deserve it after all! Disclaimer: This is a fully independent, unsponsored review.